Each year, All Sports United's Humanitarian Award celebrates the effort and achievement of one very deserving philanthropist in the world of Sports. The All Stars of Giving campaign, now in its 4th year with Givkwik, helps us find that special person. This year, Xocial joins us to add some competition into the campaign. Here's how it works: Help us identify this year's ten most giving of sports stars and personalities and celebrate them as the 2017 All Stars of Giving. Join a team to raise awareness and money for its designated charity. 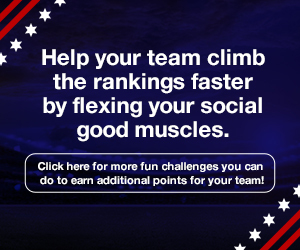 The more you do for your team - favorite, donate, and share - the more points your team will earn and the better your team's chances of winning the $10,000 grand prize for your charity! Voting has now closed. Thank you for participating. Philanthropy is at the heart of our society. For years, sports personalities have graced the news with stories of excellence. But more recently, the content has been skewed towards examples of defeat. All Sports United created the "Humanitarian Award" to recognize the achievements of deserving sports philanthropists and for the past few years, worked with Givkwik and multiple other partners to expand the program. Our goal is to bring MORE positive news to the world, and highlight the amazing works of so many. Check out last year's finalists here. Please help us to identify the most GIVING sports personalities in North America. Approved nominees will compete in a tournament style competition in which fan voting determines the top ten Finalists. The finalists will then be assessed by the All Sports United selection committee to determine with winner of the 2017 All Stars of Giving Humanitarian of the Year Award. All Sports United created the "Humanitarian Award" to recognize the effort of a deserving sports philanthropist each year. Now in its 5th year, All Sports United is excited to partner again with its technology provider Givkwik and multiple other partners to expand the program. Our goal is to bring positive news to the sports world, and highlight the amazing works of so many. Check out last year's finalists here. Please help us to identify the country's most giving sports personalities. Approved nominees will compete in a tournament style competition, with fan voting helping to determine who becomes our Finalists. The All Stars of Giving is an online campaign where you can join your fellow fans in helping select 10 "All Star" philanthropists in the world of sports. One of those All Stars will then be crowned the Humanitarian of the Year by All Sports United and receive a cash reward for his/her favorite cause. If you're inspired by one of the candidates' stories, donate to their specific cause right here. Your actions (donating, favoriting, boosting, and sharing) will determine our All Stars for this year. Overall team activity will determine our final 10 All Stars. A selection committee determined by All Sports United will identify and announce the winner of their 2017 Humanitarian of the Year Award during July of 2017. Points accumulated and displayed for activity on sponsor platforms - like Xocial - count for a portion of the overall activity for this campaign. The Givkwik system determines the overall winners. Inspired by a champion's cause? Donate today. You can donate to any of the causes championed by the candidates through this campaign. Once the campaign is complete, each cause will receive an unrestricted grant reflecting any donations made to them through the campaign page. All donations will go to the Givkwik Fund managed by a 501(c)3 nonprofit financial services firm and may be tax deductible (consult your tax professional).